The idea of aeroponics has been circulating for at least a half a century after scientists studying plant roots realized that exposed roots, nourished by water vapor, would still yield plants. 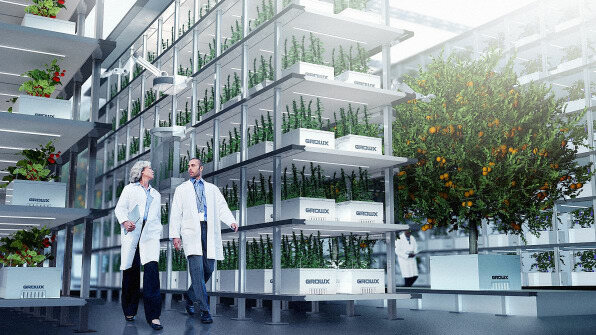 Aeroponics requires no soil nor any hydroponic apparatus–instead, the roots of the plants are suspended in controlled, moist environments and fed that way. NASA used aeroponics to grow beans aboard the MIR space station in 1996; research from that experiment, Martin says, showed that aeroponics requires 95% less water than traditional outdoor farming, 40% less water than indoor hydroponic systems, and results in growth rates as much as 300% larger than traditional yields.“But despite the obvious benefits, it’s been largely uncommercialized,” Martin tells Fast Company, though AeroFarms, a non-marijuana vertical farm in Newark, New Jersey, is using the technology as the backbone of its operation. Aeroponics is inherently challenging for a number of reasons. Plant roots are hypersensitive, and the success of the technology depends on meticulously regulating the size and speed of the water droplets used to mist the roots, as well as the temperature in the “root chamber” from which the plant grows. Water the roots too little, and you’ll kill the plant; water them too frequently, Martin says, and you’ll inhibit their ability to absorb oxygen from the air, which is the key to aeroponics. Trump’s making the migrant caravan a political issue. Here are the facts.